a. A filled registration form including a 4x6 photo. b. 02 4x6 photos (no older than 6 months). c. A copy of a valid identification card/ passport; original documents are required for verification. The registration form is available at test offices or can be downloaded here. Candidates must sign in the registration form. Deadline for registration: no later than 7 working days before the exam date. NB. 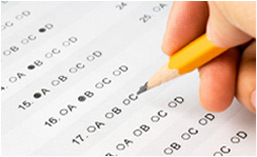 It is required that the 2 exams be at least 30 days apart (not including the exam dates). Otherwise the result of the second exam will not be acknowledged. Exam fee: 650.000 VND/ candidate/ exam. The exam fee is non-refunded in any case. After the transfer, candidates must send the receipt to the email address: info@etcvnu.edu.vn and the VNU-ETC will issue the exam admission voucher, which can be picked 1 to 2 day prior to the test date at the latest.